Grease and flour a 8 x 12 inch pan. Preheat the oven to 350 degrees F (175 degrees C). Separate 5 eggs, and beat the egg whites in a large mixing bowl. Add 1 cup sugar slowly to the egg whites, beating constantly. Add the yolks one by one, beating well after each addition. Stir in the 1 teaspoon vanilla. Sift the flour, and stir it into the egg mixture. Pour the batter into the prepared pan. Bake the cake for 20 minutes, or until done. Cool. Blend the sweetened condensed milk, evaporated milk, milk, and 1 tablespoon vanilla. Pour this syrup over the cooled cake. To make Meringue Frosting: Beat 3 egg whites to soft peaks. Gradually add 1 cup sugar, and beat until stiff peaks form. Stir in 1 teaspoon vanilla. Frost the cake. A way to avoid having too much liquid is to pour the milk mixture over the cake as soon as the cake comes out of the oven. Hope this helps! It's a winner. However, some family members found it a bit too sweet but most loved it. I had made it twice already. I think I would try it with less sugar, perhaps 1/2 cup vs. 1 cup. 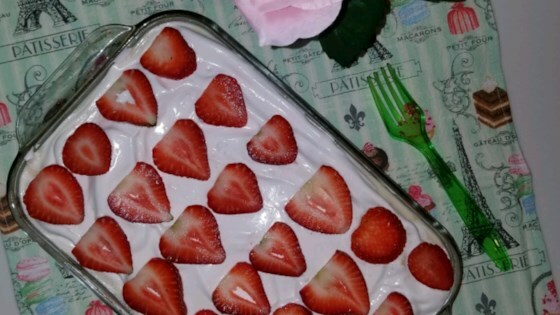 Skip the Meringue and top with strawberries, the more the better! This cake is very rich and the strawberry just makes it amazing.